Hahahahahahaha, you thought this was going to be one of those New Year's resolution posts, didn't you? The ones that are everywhere you look right now, where I promise you that this year I'm going to run at least 5 times a week every week totaling 2011 miles for the year and lose 40 pounds and run a sub-4 hour marathon. Nope. I don't really do resolutions. What's the point? If you want to change your behavior, do it now. The arbitrary nature of starting a new program with the new year is just basically a way of procrastinating. I mean, ultimately, no matter what Lindsay Lohan tweets, the Gregorian calendar that we use doesn't mean that you get a "fresh start" on 1 January because the year happens to change over. Take your fresh start now. Whenever now is. So, no resolutions here. But, since I can't resist some navel-gazing, how about my year in races? I started the new year off in January with the NYRR Emerald Nuts 4m fun run, which wasn't so fun for me. In February, I was ecstatic to do the Empire State Building Run Up. It was... hard. In March, I did the NYC Half Marathon for the first and last time. I'd do it again if I could avoid the lottery or get in for free. April saw me running through the Lincoln Tunnel, and May brought both a trail half (the North Face Endurance Challenge) and a new half PR(the Brooklyn Half Marathon) - not set at the same event, not by a long shot. In June I realized a goal I've had for quite some time and got to the top of Mount Washington... slowly. I DNF'd a half marathon in July, which turned out to be a harbinger of stupid shin splints that plagued me during August, causing me to DNS the Bronx Half Marathon. (I did do a 5k in August, though, over the Brooklyn Bridge.) By September, I was back to running too many races, including a 14.2m training run, an 18m tune-up, and the Fifth Avenue Mile, where I set a (default) mile PR. All of this racing was of course just the build up for marathon season, which I hit full force in October - sort of, or maybe marathon season hit me. I certainly am the one who seems worse for the wear. 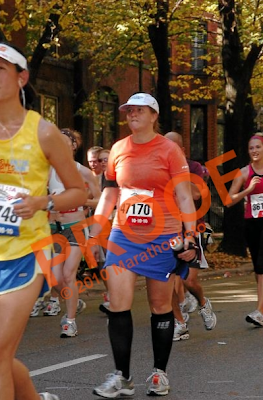 Either way, I did the Chicago Marathon in October and both the NYCM and the Flying Monkey Marathon in November. I swear I didn't mean to run three marathons in two months. It just sort of happened. I mostly took it easy through December, running one 15k race. Well, sort of two races. I did the New Year's Eve race again, but you'll have to wait a day or two to hear about that. Take home message: too many races. If I were, say, to be a total hypocrite and completely go back on all of the anti-resolution ranting I did at the top of this post, I might (might) suggest that a good resolution for me this year would be to do less racing. No more safety pins and bibs and anxiety. I mean, unless it's a really good race. It may not have been the most successful year you were hoping for, but it is I think the most interesting list of races I've seen that anyone ran. That is so cool! How did I not know there was such a thing as the Lincoln Tunnel 5k? How far is that marathon, anyway? How did I not know this already?!? How much would you pay for a gym?